BREKHOV, O. , RATNIKOV, M.
This article approaches the solution of FPGA testing and research of characteristics at early development stages. The approach offers error-detection code based on universal test firmware. The performed test firmware based on CRC and Hamming codes detect single and multiple faults, and locate fault place (for Hamming code based test firmware). B. Pratt, M. Caffrey, P. Graham, K. Morgan, M. Wirthlin, "Improving FPGA Design Robustness with Partial TMR," IRPS 2006. D. V. Bobrovsky, O.A. Kalashnikov, P.V.Nekrasov, "Functional Control Technique for FPGA Total Ionizing Dose Testing," Proceedings of the Conference RADECS-2012. R. N. Williams. A Painless Guide to CRC Error Detection Algorithms. Rocksoft Pty Ltd., Australia, 1993. P. P. Shirvani, E. J. McCluskey, "Fault-Tolerant Systems in a Space Environment: The CRC ARGOS Project," CRC Technical Report No. 98-2 (CSL TR No. 98-774), December 1998, Center For Reliable Computing, Computer Systems Laboratory, Departments of Electrical Engineering and Computer Science, Stanford University, Stanford, California 94305. IEEE Standard for SystemVerilog Unified Hardware Design, Specification, and Verification Language, The Institute of Electrical and Electronics Engineers, Inc. 3 Park Avenue, New York, NY 10016-5997, USA, 2005. K. Arshak, E. Jafer, C. Ibala, "Testing FPGA based digital system using XILINX ChipScope logic analyzer," in Electronics Technology. ISSE '06, pp. 355-360, May 10-14, 2006. 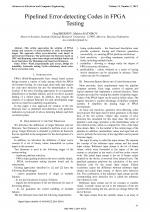 K. S. Morgan, D. E. Johnson, B. H. Pratt, M. J. Wirthlin, M. P. Caffrey, P. S. Graham, "SEU Induced Error Propagation in FPGAs," in Proceedings of NSREC Conference, Seattle, WA, July 11-15, 2005, Brigham Young University, 459 CB Provo, UT 84602, Los Alamos National Laboratory, Los Alamos, NM 87545. H. H. Schmit, S. Cadamni, M. Moe, S.C. Goldstein, "Pipeline Reconfigurable FPGAs," Journal of VLSI Signal Processing Systems 24, Kluwer Academic Publishers, pp. 129-146, 2000. B. F. Dutton, C. E. Stroud, "Built-In Self-Test of Configurable Logic Blocks in Virtex-5 FPGAs," in Proceedings of 41st Southeastern Symposium on System Theory, pp. 230-234, 2009. I. G. Harris, Russell Tessier, "Testing and Diagnosis of Interconnect Faults in Cluster-Based FPGA Architectures," in ICCAD'00 Proceedings of 2000 IEEE/ACM International Conference on Computer-aided design, pp. 472-476, IEEE Press Piscataway, NJ, USA ©2000. A. Sarvi, C. A. Sharma, R.F. DeMara, "Bist-Based Group Testing for Diagnosis of Embedded FPGA Cores," ESA, pp. 279-283, CSREA Press, 2008. M. Rozkovec, J. Jenicheck, Z. Pliva, "Using deterministic test vectors to test FPGA circuit," Proceedings of the 2013 IEEE 16th International Symposium on Design and Diagnostics of Electronic Circuits & Systems (DDECS), pp. 175-180, 2013. F. Noorbasha, K. Harikishore, Ch. Hemanth, A. Sivasairam, V. Vijaya Raju, "LFSR Test Pattern For Fault Detection and Diagnosis for FPGA CLB Cells," International Journal of Advances in Engineering & Technology, ISSN: 2231-1963, 240, Vol. 3, Issue 1, pp. 240-246, March 2012. C.-F. Wu, C.-W. Wu, "Testing and Diagnosing Dynamic Reconfigurable FPGA," VLSI Design, Volume 10, Issue 3, pp. 321-333, 2000. Y.-B. Liao, P. Li, A.-W. Ruan, Y.-W. Wang, W.-C. Li, "A HW/SW Co-Verification Technique for FPGA Test," Journal of Electronic Science and Technology of China, Vol. 7, No. 4, 390, December 2009. Y.-C. Chiu, B. Tarun, S. Ye, P.-I Yeh, P.-A. Shen, "The FPGA test system. Project Final Report," Group 5, University of Southern California, December 2010. Citations for references updated on 2019-04-20 10:46 in 61 seconds. Website conception, design and maintenance by Eugen COCA. Content updated on 28 Feb 2019. Site engine updated on 28 Feb 2019. This page was generated on the server in 0.071 seconds and loaded in your browser in > seconds.